Arduino software is needed to program Arduino boards and must be downloaded from the Arduino website and installed on a computer. This software is known as the Arduino IDE (Integrated Development Environment). Drivers must be installed in order to be able to program an Arduino from the Arduino IDE. 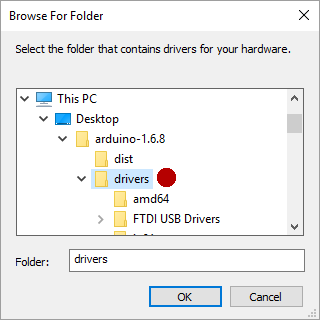 This article shows how to download and install the Arduino IDE software and drivers on a Windows 10 computer. Go to the Arduino Software download page where you will find two downloads for Windows – Windows installer and Windows ZIP as shown in the image below. You can choose either of the two Windows options, but I prefer to use the ZIP file because it keeps the Windows system cleaner. The Windows Installer version of the software will download an installer which will install the software into the Windows system. The Windows ZIP file allows you to unzip the Arduino IDE to any location of your choice and easily remove it if you want by simply deleting the unzipped folder. This installation guide uses the Windows ZIP file, so download the ZIP file and proceed to the installation step below. After clicking the download link, you will have the option of making a donation to Arduino or just downloading the file for free. After downloading the Arduino Windows ZIP file, simply double-click it and then copy the folder from inside the zip file to the desired location. I prefer to copy it to my desktop. To avoid any confusion: the file that is downloaded is a file and not a folder, although it is called a "Compressed (zipped) Folder" in Windows. Open the folder that you extracted from the zipped file and double click arduino.exe in the folder to start the Arduino IDE software. If you can not see file extension (the .exe on the file name), turn them on in the file manager by clicking View → File name extensions. If you want to create a shortcut to the Arduino IDE on your desktop, start dragging the arduino.exe file to the desktop and hold down the Ctrl + Shift keys before dropping it on the desktop. This will create a shortcut to the Arduino IDE instead of moving the file to the desktop. Make sure that you have not moved the arduino.exe file by looking at the name of the file on your desktop which should contain the word "Shortcut" at the end. You can rename this shortcut to just Arduino or Arduino IDE. When you plug an Arduino board into a Windows 10 computer, a driver should automatically be installed for it. The driver configures the Arduino as a virtual COM port which can be seen in the Device Manager. 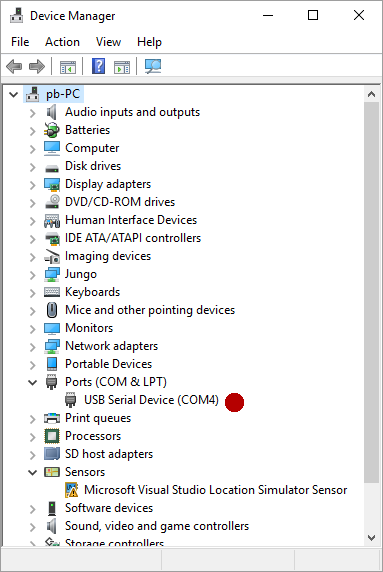 Open the Device Manager window by right-clicking the Windows 10 start button in the lower left of the screen and then selecting Device Manager on the menu that pops up. 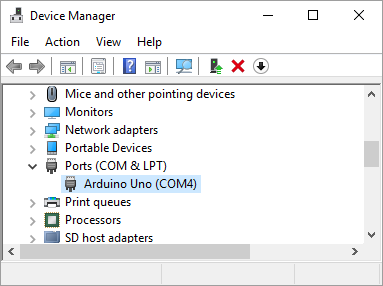 In Device Manager, expand Ports (COM & LPT) and you should see a COM port which will be your Arduino as shown in the image below. If you have other COM ports on the PC, then unplug the Arduino to see which COM port disappears from the device manager, then plug the Arduino back in and see which port appears – this will be the Arduino port, e.g. COM4 in the image below. 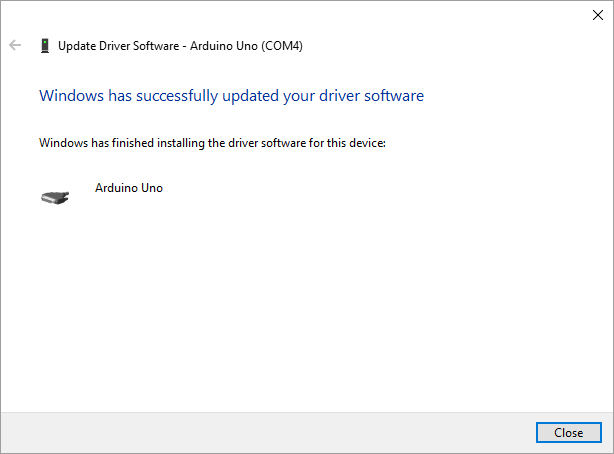 The drivers that come with the Arduino software can be installed instead of the default Windows 10 driver, which is explained next. In the Device Manager, right-click the COM port that was identified as the Arduino (the Arduino must be plugged into the computer first). Select Update Driver Software... from the menu that pops up. 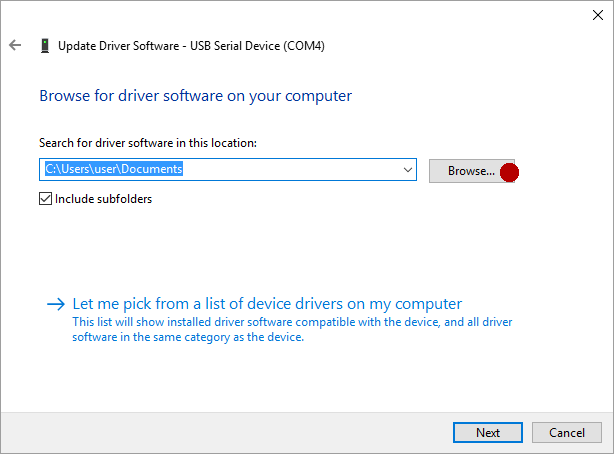 In the dialog box that opens, select Browse my computer for driver software. In the next dialog box, make sure that Include subfolders is checked and then click the Browse... button. In the dialog box that pops up, navigate to the drivers subfolder of the Arduino folder that you unzipped earlier. Click the drivers folder to select it and then click the OK button. 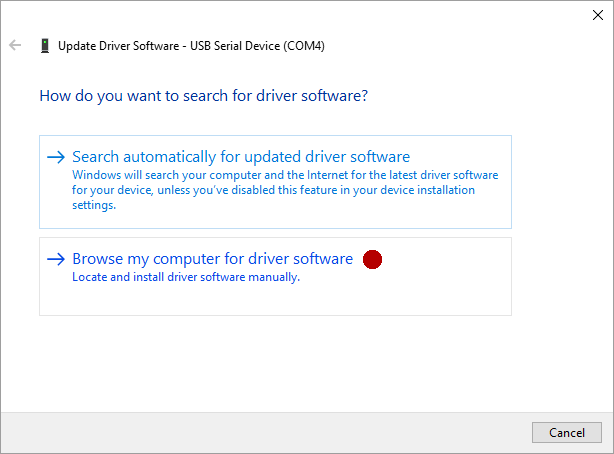 Back in the Update Driver Software dialog box, the correct path to search for the drivers is set. 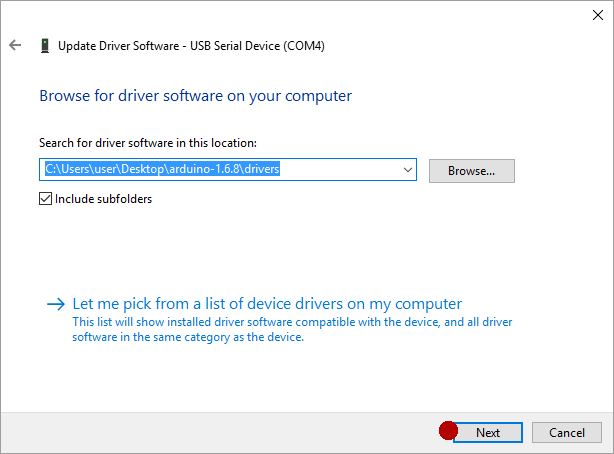 Click the Next button to start the driver installation. In the Windows Security dialog box that pops up, click Install. After the driver has been installed, a dialog box will appear that shows that the driver has been successfully updated and will display the Arduino COM port number. Finally back in the Device Manager, the COM port is now identified as an Arduino when the Arduino driver from the Arduino IDE folder is installed.